Are You Interested in Having a Porch Cover Installed on Your Home in the St. Paul, MN, Area? If you would like to add a stylish and sturdy porch cover to your home in or around the St. Paul, Minnesota, area, turn to the knowledgeable professionals at U.S. Patio Systems and Home Remodeling. We sell and install beautiful and long-lasting patio covers that transform underutilized backyards into comfortable outdoor living areas. After you have a porch cover installed on your home in the St. Paul, MN, area, you’ll have the perfect shaded space to grow shade-loving plants, host outdoor get-togethers, and spend some quiet alone time when you are in need of some rest and relaxation. With your new cool patio, you’ll be able to enjoy the outdoors like never before. Plus, when you turn to us for your patio cover, you can rest assured that your investment is protected, since it will come backed by our Lifetime Warranty. 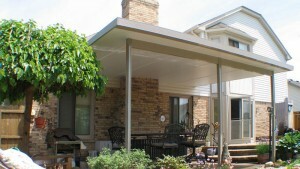 Contact U.S. Patio Systems and Home Remodeling today to learn more about adding a TEMO porch cover to your home. One of our friendly specialists is available to answer any questions you have and can tell you in detail all about the impressive products and services we offer to homeowners around the St. Paul, MN, area.